One of the major product announcements during Apple’s action-packed WWDC 2017 keynote this week was the updated iMac. Sporting the latest hardware — including Kaby Lake processors, AMD RX 580 GPUs, Thunderbolt 3, and even faster NVMe flash storage — the new iMacs finally provided the serious upgrade that all-in-one Mac fans had been waiting for. But one technical specification of the new systems introduced a few quirky notes and caveats: the RAM. Apple fans know that the company has a bit of an odd relationship with consumers when it comes to Mac RAM. From highly inflated RAM upgrade prices, to non-user-upgradeable RAM in most of its Mac configurations, to conflicting “official” RAM limits, things can be a bit confusing these days for anyone looking to buy or upgrade a Mac. Keeping with this awkward tradition, the RAM situation for Apple’s new iMacs is still just as confusing. So here’s a quick rundown of what we know so far when it comes to system memory on these new iMacs. Apple noted during the iMac section of the keynote that its mid- and high-end 2017 27-inch iMac models now support a maximum of 64GB of RAM. While it’s good to see Apple raise the “official” limit, the previous 2015 27-inch iMac also supported 64GB of RAM just fine, even though Apple’s official limit was only 32GB. So if you’ve got a 2015 iMac and are considering the 2017 upgrade for the increased RAM limit, you may want to try a RAM upgrade instead. Sure, the new iMacs use faster DDR4 memory, but many applications value the quantity of RAM over the speed, at least to a certain degree. 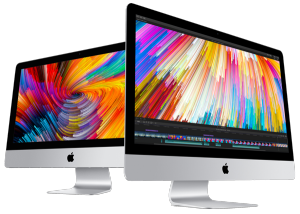 As mentioned above, only the mid- and high-end 27-inch iMacs support 64GB of RAM, with Apple taking the time to clarify that the entry-level 27-inch model is limited to 32GB. This was odd, as all three iMacs utilize the same chipset and processor platform. It was therefore not surprising to see our friends at Other World Computing quickly confirm that the entry-level iMac does indeed support the full 64GB of RAM. You won’t be able to buy more than 32GB of memory for the base 27-inch iMac via Apple’s online store configurator (why would you want to do that anyway? ), but it’s good to know that you’ll be able to max out the RAM on all 27-inch models with the help of third party suppliers. While not new to the 2017 iMac update, it’s important to reiterate that the RAM is not user-upgradeable on the 21.5-inch iMacs. This means that those buying these machines will need to shell out the extra cash up front to ensure that they have enough RAM to keep their iMac running smoothly not just today, but for however many years you want the system to remain viable. That means spending an extra $200 for 16GB or $600 for 32GB at purchase. Ouch. The process to upgrade the RAM in a 2017 iMac is just as simple and easy as it was before. Check out Apple’s instructions for details. The upcoming iMac Pro, set for release this December, is an entirely different beast. Unlike the “standard” iMac, the iMac Pro uses error-correcting code (ECC) memory, which helps counter any errors or corruption that may occur while data is stored in memory. This is crucial for the reliability of mission critical applications and databases, although its benefits likely won’t be noticed by most prospective iMac Pro buyers who are primarily interested in the system’s computational and graphical capabilities. While “mobile” size SO-DIMMs with ECC exist, early marketing images from Apple indicate that the company is instead using full-size DIMMs in the iMac Pro. This means that Apple needed to rearrange the components to fit the larger RAM modules inside the iMac Pro’s chassis. For consumers, it means that the RAM in the iMac Pro won’t be officially user-upgradeable. The potentially good news is that those same marketing images — which, of course, may not represent the final design — show what appear to be socketed RAM slots. If true, iMac Pro owners could upgrade their RAM post-purchase, but only if they’d be willing to perform the complicated and risky iMac teardown procedure. For those unwilling to do so, you’ll be stuck along with the owners of the standard 21.5-inch iMac in needing to purchase your RAM up-front from Apple. We don’t have upgrade pricing yet, but we do know that the iMac Pro’s $5,000 base configuration with ship with 32GB of RAM, and that buyers will have the option to upgrade to either 64GB or 128GB at purchase. To answer my own question: The glass is glued down. Also, you have to remove the logic board to get to the RAM slots. Still, better than soldered-down. It’s good to know they’ve taken a step back from complete lockdown. Do the new iMacs have magnetically-attached glass or is it glued down? iFixit now reports the new 21.5 iMac uses replaceable RAM in the form of two SO-DIMM slots – for those daring enough to take the iMac apart. Only if you pay at least $1799 for your iMac. That’s ridiculous in 2017. This is what makes some people hate Apple and now I find these products and policies no longer defensible. RAM was the last thing that you could count on to give your Mac a little boost after a few years (along with SSD storage if you are willing to tear apart an iMac). And the worst part is there is no practical reason for it; a few millimeters thinner and a few grams lighter make no difference in a desktop system. My “new Mac” is an old HP minitower I bought on eBay. It’s good to know that you can still upgrade the RAM yourself.